The new deal includes high performance, award winning carbon frames such as the Pro Carbon Road, Stealth Time Trial, XLS Cyclocross and Dirty Harry 29er MTB. Moreover, we've matched all remaining stocks of the top end Exocet and Exocet Revision 4 TT frames to the magic £399 price as well - saving a massive 43% on the RRP! 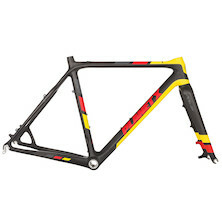 Planet X carbon frames have always offered more bang for buck than our competitors. We don't sell on to third party wholesalers or retailers. We don't take excessive profits, bonuses or company rewards. And most of all we drive our designers, suppliers and purchasing team hard - getting the best product at the keenest price possible. Planet X carbon frames are now £399 for a limited time only. Don't miss out!